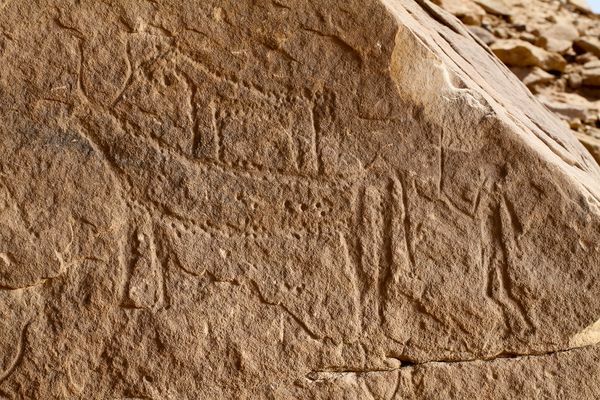 A closer look at the cattle scene shows one of the animals with a dog on its back and a human figure wielding what looks like a staff or stick just behind it. To create the images, the artist positioned a copper or stone chisel on the surface of the rock and tapped the tool with a heavy object, a technique called "pecking." The resulting pictures are made of many small dimples in the surface of the rock—akin to pointillism in stone. Even at the dawn of unified Egypt, the artists were probably professionals linked to the royal court, the researchers say. 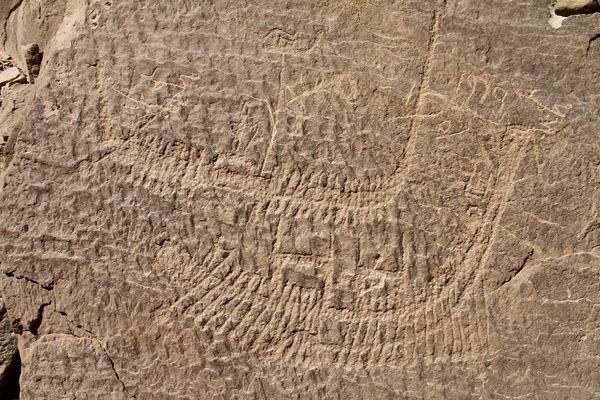 One of the largest scenes at Nag el-Hamdulab shows two boats equipped with rows of oars and an oarsman at the stern. The lower boat has a bull standard on its prow. A king wearing the White Crown stands on the cabin of the upper boat. Next to him is a standard bearing an image of Wepwaout, a dog-like god of war and hunting. Though the site is in the desert, it's not surprising to see images of boats, which would've transported the king and his retinue up and down the nearby Nile. The sloping slab of rock in the center of the hillside bears the image of a king standing on the boat cabin. 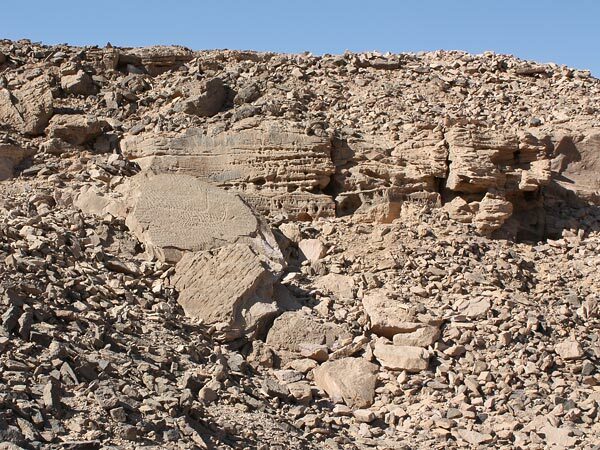 All the rock art at Nag el-Hamdulab borders an expanse of barren sand, but the site's historic isolation and forbidding terrain have not protected it from vandalism. In some places, the pictures have been deliberately chiseled off, while in at least one other place, a man etched his name and the year—1960—on top of a 5,000-year-old image. The researchers fear for the future of the White Crown pharaoh. Though there are two guards keeping watch over Nag el-Hamdulab, human activity in the area has soared in the last decade and a half, thanks to the construction of a bridge linking it to the more populated east bank of the Nile. The destruction "is really a shame, because they were still perfectly preserved a few decades ago," Gatto said. "How can we protect them, how can we save them? It's such an important site, so that's the concern we have now."